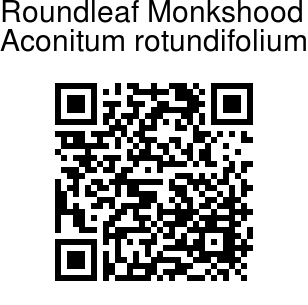 Roundleaf Monkshood is a biennial herb, with paired tubers. Stem is erect or ascending 10-40 cm tall, round, hairless below, velvety above, single or branched in the upper part. Leaves are mostly at the base, forming rosettes, with long stalks, circular or obovate, incised-toothed to deeply cut, lobes narrowly linear, nearly entire. Stem-leaves are lacking or a few, similar to the basal leaves, but smaller and with shorter stalks. Flowers are borne in few-flowered, lax, clusters. Lower bracts are 3-5-partite, upper ones undivided, linear, entire. Lower flower-stalks are up to 2 cm, upper shorter. Sepals are pale or purple-blue or variegated, densely or sparsely velvet-hairy, helmet 1.2-2 cm high, 1.5-2.5 cm long, 4-7 mm wide in the upper part, rostrate, lateral sepals obovate or circular, about1.5 x 1-1.3 cm, lower sepals deflexed, oblong-elliptical to oblong, up to 8 mm. Petals have a 1.2-1.5 cm long claw, hood narrow, cylindrical, bilabiate at apex. Seed-pods are 9-13 mm, softly hairy. 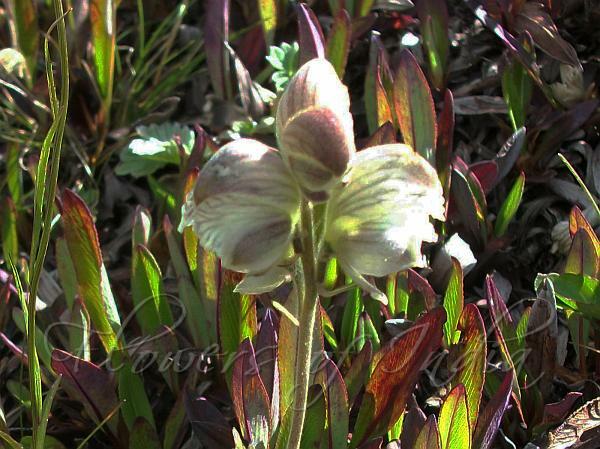 Roundleaf Monkshood is found in the Himalayas, from Afghanistan, Kashmir to Nepal, and C. Asia, at altitudes of 2700-4400 m. Flowering: August-September.